Eric Schmidt you’re a LIAR! Google has committed “the biggest known data protection violations in history.” —Johannes Caspar, chief of data protection office in Hamburg, Germany. Based on the above, we believe the readers can and should bring a class-action lawsuit against Google.com, which would at least serve to exposing the unethical firm and could potentially lead to a global boycott. We do NOT underestimate Google’s vast influence over the government branches. Please see also numerous other entries posted on this blog concerning Google censorship. Google Corporate Terrorism: A Conspiracy Against the People! Google’s Corporate Practices are a Major Threat to Freedom and Democracy! 1. Google is an information terrorist and therefore a threat to democracy and freedom. Either way, Google’s corporate practices pose a serious threat to democracy, the rule of law and our individual freedoms. How much longer is Google allowed to continue violating with impunity the United States Constitution and the international law? The Moderators at the public information blogs listed below condemn Google in the strongest possible terms for content censorship. Google search engines filter, block and bury blog posts that contain contents or information the cabal deems uncomplimentary to its businesses and its business partners, thereby preventing the public from discovering the truth! Google poses a clear and present danger to the democracy, individual freedoms and therefore the security of the United States and the rest of the ‘free world.’ To minimize Google threat, we urge those of the lawmakers who still believe in the Constitution to break up the company into much smaller, less harmful units. Google says their motto is “Do No Evil!” yet most of its immoral earnings come from predatory advertising, and its corporate practice is suppression of information! Note: The above image incorporates the Google logo, which is a trade mark of that disgraceful corporation. Google poses a clear and present danger to democracy and our freedoms. To minimize this threat, we urge those of the lawmakers who still believe in the U-S Constitution to break up Google into much smaller, less harmful units. As a near-monopoly of the global flow of information, Google is in flagrant breach of Sherman Antitrust Act and the EEC antitrust laws. Google is promoting own commercial interests and political agenda by manipulating information flow and search results. No single corporation in the U.S. poses as much threat to democracy, individual freedoms and therefore the security of the country as does Google! Google censoring of Fire-Earth and affiliated blogs listed below is intensifying! Many of our blog entries that criticize a public figure, corporation, faulty product, tainted food or indeed a host of other things that are deemed to be harmful to our readers, are filtered out and buried by the Internet mafia’s search engines. So far, even a mere mention of the following names in the blogs’ entries has resulted in those posts receiving up to 100 times fewer hits than the average entries do on the respective blogs. Example: When Google “disliked” Sarah Palin, Sarah Palin Joins TV Network for Mentally Challenged received about 550 hits per day. This Week: Sarah Palin Joins TV Network for Mentally Challenged has received less than 7 hits per day. OK, she is no longer running for the No. 2 job in the country, but she is still a high profile figure. There are also numerous other examples that verify our findings. 5. Fox News, CNN and All other Google partners (Fire-Earth believes that Google delays listing of many blog posts on the internet, thereby allowing its partners to duplicate and broadcast the topic/concept before the bloggers’ messages become searchable). Clinton to China: Do as we say, NOT as we do! If Google China censorship in China is done to appease the Chinese government, who or what is Google, Inc (the leading Internet Mafia) appeasing by filtering, blocking and burying certain information posted on Fire-Earth (this Blog)? Mrs Clinton to Chinese Government: (Pointing with one hand) What you are asking Google to do is suppression of democracy; (pointing with the other hand) Google censorship in the US and rest of the ‘free world’ is for our own good. Google is trying to protect our way of life. Image source unknown. Image may be subject to copyright. News, information and analysis of public value on the blogs listed below are also censored, blocked or buried, by Google, Inc. Note: The above image incorporates the Google logo, which is a trade mark of that disgraceful corporation. Click image to enlarge! Google says their motto is “Do No Evil!” yet most of their immoral earnings come from predatory advertising, and their corporate practice is suppression of information! The National Oceanic and Atmospheric Administration, NOAA, is targeted by Google for eventual takeover. Now picture this, Einstein: Most of you guys would be out of a job as soon as Google can seize the opportunity to engineer a “takeover” and have NOAA bastardized into tiny commercial/ semi-commercial units. The National Oceanic and Atmospheric Administration (NOAA) is a government organization whose roots go back more than two centuries. It collects, analyzes, predicts and disseminates data on weather. Why does it need a corporate predator to teach it how to chew the fat, or shoot the breeze? NOT for much longer, if Google has anything to do with it. Translation: Don’t hold your breath! NOAA’s Office of Oceanic and Atmospheric Research and Google have signed a cooperative research and development agreement outlining how they will work together to create state-of-the-art visualizations of scientific data to illustrate how our planet works. You mean a business deal, where Google stands behind, while NOAA grabs its proverbial ankles, right? Why fix something, if it ain’t broke? It’s unclear whether the deal was authorized by Richard W. Spinrad, Ph.D., NOAA assistant administrator, or signed by NOAA Administrator, Dr. Jane Lubchenco. Under the agreement, NOAA and Google plan to work together on research and development to join NOAA’s oceanographic, meteorological, biological, and climatological data with Google’s software capabilities. The wide availability of Google’s Internet tools has the potential to bring visualizations of NOAA data to new audiences around the world. Oh, really? Have you asked Google just exactly why THEY are doing all this and WHAT exactly THEY expect to get from it, Mr Assistant Administrator? Of course not! I bet you’re too busy admiring the wine! What’s wrong with NOAA and the intelligent parts of NASA and … working together? What’s the problem, are they short of scientists, funds, time or something? Dr. Jane Lubchenco, as NOAA Administrator YOU have a duty to protect national assets. Google is a predatory, non-charitable organization. PULL out of the deal before they DESTROY NOAA and our national assets. Stop the grossly greedy google growing gigantic gobbling govt goods! A single judge, Denny Chin, is about hold a hearing concerning the arguments for and against a contentious deal between the Internet Goliath, Google (dubbed the Internet leading mafia family), and US authors and publishers, some 26 interested parties. The intelligent consensus is that the deal would provide the search Goliath with a monopoly over online books sales. “Google already processes about two-thirds of the search requests in the United States, an advantage that led the company to rake in $79 billion in revenue during the past five years — mostly from short ads posted alongside search results and other Web content. ” —The Associated Press. Google lands in brown goo again! Google Information Terrorism: A Conspiracy Against the People! PHAILIN Becomes a Super Cyclonic Storm: Google is not listing most of the images posted on FIRE-EARTH, or delay listing them for several days until they’ve lost their immediate relevance. Google has been fined €2.4bn ($2.7bn; £2.1bn) by the European Commission after it ruled the company had abused its power by promoting its own shopping comparison service at the top of search results. The US company may decide to appeal. Google had previously suggested that Amazon and eBay had more influence over the public’s spending habits and that the commission’s views “failed to fit the reality of how most people shop online”. However, the decision could set a precedent that determines how the EU’s civil service handles related complaints about the prominence Google gives to its own maps, flight price results and local business listings within its search tools. Google Shopping displays relevant products’ images and prices alongside the names of shops they are available from and review scores, if available. The details are labelled as being “sponsored”, reflecting the fact that, unlike normal search results, they only include items that sellers have paid to appear. On smartphones, the facility typically dominates “above-the-fold” content, meaning users might not see any traditional links unless they scroll down. Google also benefits from the fact the Shopping service adverts are more visual than its text-based ads. One recent study suggested Shopping accounts for 74% of all retail-related ads clicked on within Google Search results. However, the BBC understands Google’s own data indicates the true figure is smaller. The European Commission has been investigating Google Shopping since late 2010. The probe was spurred on by complaints from Microsoft, among others. The rival tech giant has opted not to comment on the ruling, after the two struck a deal last year to try to avoid such legal battles in the future. But one price comparison service has welcomed the fine. “An entire industry has suffered because of Google’s unlawful, anticompetitive behaviour, and it has become a genuine struggle for survival for the likes of [us],” the chief executive of Kelkoo Richard Stables told the BBC. Although the penalty is record-sized, it could have been bigger. The commission has the power to fine Google’s parent company, Alphabet, up to 10% of its annual revenue, which was more than $90bn (£70.8bn) in its last financial year. Again, don’t hold your breath! [R.G, FIRE-EARTH Moderators have posted lots of relevant information about google censorship on this site. IF you are interested to learn more, please search the site using the corresponding/appropriate keywords. But PI is convinced the audit proves “criminal intent”. “The independent audit of the Google system shows that the system used for the wi-fi collection intentionally separated out unencrypted content (payload data) of communications and systematically wrote this data to hard drives. This is equivalent to placing a hard tap and a digital recorder onto a phone wire without consent or authorisation,” said PI in a statement. “The Germans are almost certain to prosecute. Because there was intent, they have no choice but to prosecute,” said Simon Davies, head of PI. “I don’t see any alternative but for us to go to Scotland Yard,” said Mr Davies. “As we have said before, this was a mistake. The report today confirms that Google did indeed collect and store payload data from unencrypted wi-fi networks, but not from networks that were encrypted. We are continuing to work with the relevant authorities to respond to their questions and concerns,” said a Google spokesman. “This was a failure of communication between and within teams,” he added. “The idea that this was a work of a lone engineer doesn’t add up. This is complex code and it must have been given a budget and been overseen. Google has asserted that all its projects are rigorously checked,” said Mr Davies. “It goes to the heart of a systematic failure of management and of duty of care,” he added. I enjoyed your blog site…especially this post! The info I post on my blog is so heavily manipulated by Google that regardless of how many entries are posted, the blog gets a similar weekly view pattern, repeating. This blog is heavily filtered by Google, Inc. Information published here could potentially save your and your loved one’s life. If you receive an injury because Google prevented you from receiving the vital news and travel advice posted here, you may have a case for suing the ‘search engine’ for damages! I found this through google. Hm? 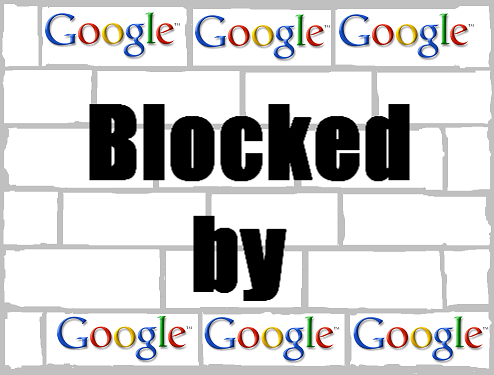 google filters/ blocks/ censors/ hides/ downgrades and otherwise impedes only the entries that it doesn’t like! As much as I hate the idea of Google filtering websites – and it REALLY irks me – forcing their hand from a governmental standpoint is Fascist. So, just like anti-virus programs (I use 4 because they all catch things the others don’t) I also use other search engines like Cuil, Ask.com, AltaVista,etc. I encourage others to do the same. I can’t help but notice that “Cuil” does not show-up in Google’s search results – that must be because Cuil was started by ex-Google techies. (2) There were no advertisements – which also chew-up bandwidth. (3) Search results ranking was purely based on relevance and the resulting websites volume of traffic – with (I think) relevance having the most “weight”. GOOGLE HAS FORGOTTEN WHAT MADE THEM POPULAR, their search results are no longer relevant to the searchers’ needs, but are driven based on THEIR need for revenue. Even more frightening, if you know the right strings, Google can get you into places you thought you would never be able to “hack” into because they are so “secure”. Like so many before them, they are going through Les Misérables phase. Soon they’ll join the likes of AOL.